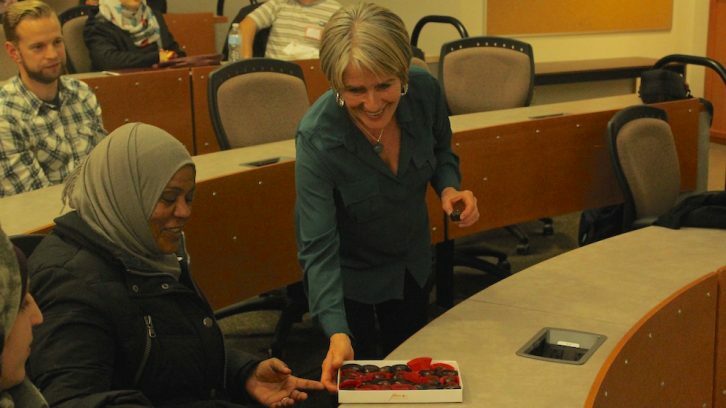 A first of its kind conference was held at Dalhousie University over the weekend for Syrian entrepreneurs looking to start a business in Nova Scotia. Over 1,000 Syrian refugees and their families have recently settled in the province and they have arrived with business ideas they had been waiting to showcase. A partnership effort between Enactus Canada and Fusion Halifax, the entrepreneurial conference included sessions on cover letters and resumes, interview workshops and a pitching competition where a panel of judges awarded startup funds to the top three plans. The conference taught cultural norms like eye contact or handshakes and women in the workforce, said Dalrymple. It also included a team of translators and speakers in both English and Arabic. Syrian Chef Abod catered the conference. Saturday evening’s main speaker was Tareq Hadhad, the son of Assam Hadhad, the Syrian chocolatier living in Antigonish whose success was recognized by Justin Trudeau at the UN. 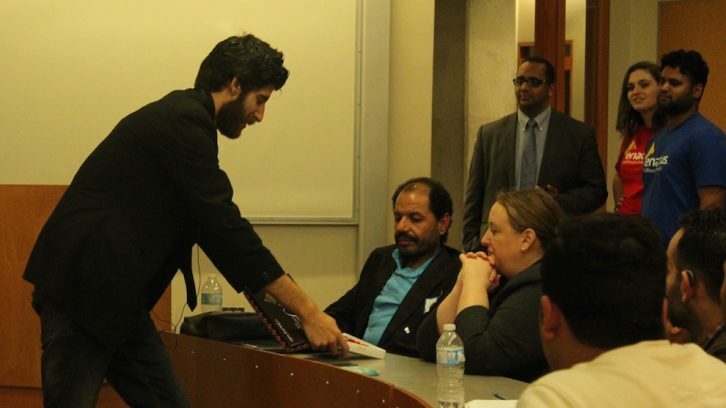 Hadhad spoke to the crowd of newcomers and Canadians about his father’s humble beginnings in Damascus. “It was such a simple company when he started, just a few meters by a few meters, and then he moved to a bigger place,” said Hadhad. By 2010, the Hadhad family was funding success and exporting to 15 countries including Turkey, Lebanon and Germany. But after violence broke out in Syria, the family was forced to flee to Lebanon. “If you are a refugee it means you have lost your identity, lost your belonging, you are now just a number at the UNHCR (UN Refugee Agency),” said Hadhad. In December 2015, Tareq came to Canada, ahead of the rest of his family, to settle in Antigonish. He said the opportunities here were immediate. “Everything was ready for the family to start their life: schools, healthcare, job opportunities and the most important thing – a warm home,” said Hadhad. 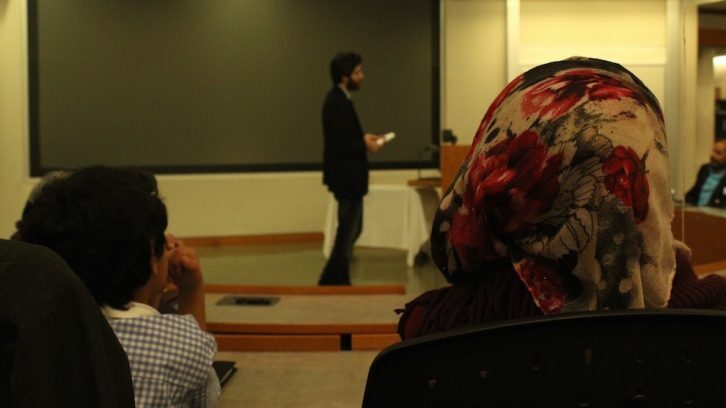 Tareq Hadhad speaks to Syrian and Canadian audience members during the conference. 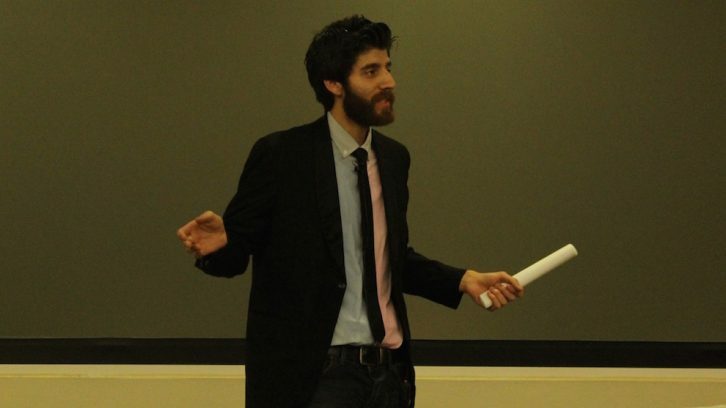 Hadhad explains his family’s journey to Canada as refugees. Hadhad passes out chocolate from his family’s business for people to sample. 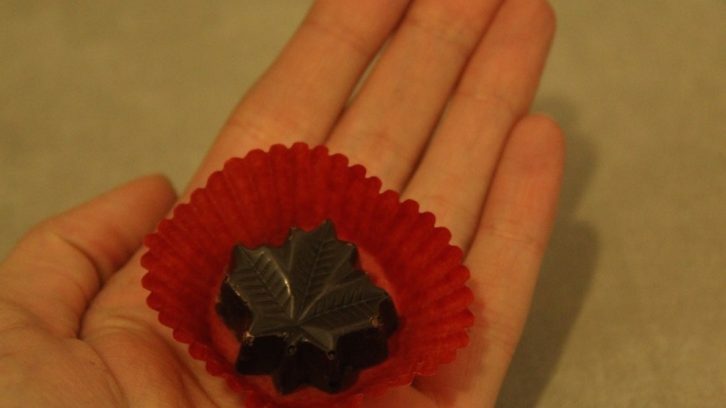 One of the chocolates from Peace by Chocolate. Audience members share chocolate from the Hadhad family. 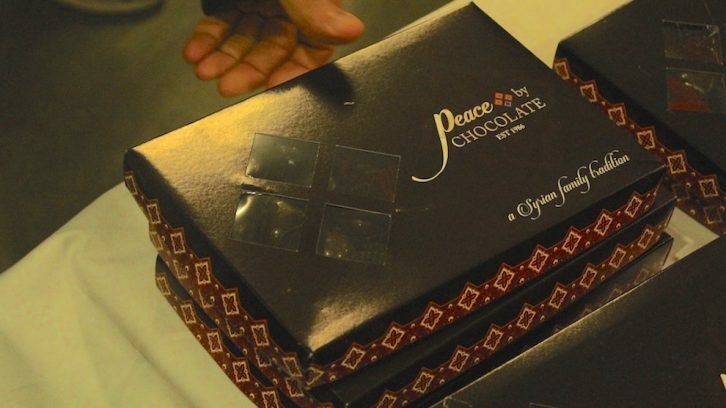 Afterwards, boxes of Peace by Chocolate quickly sold out. 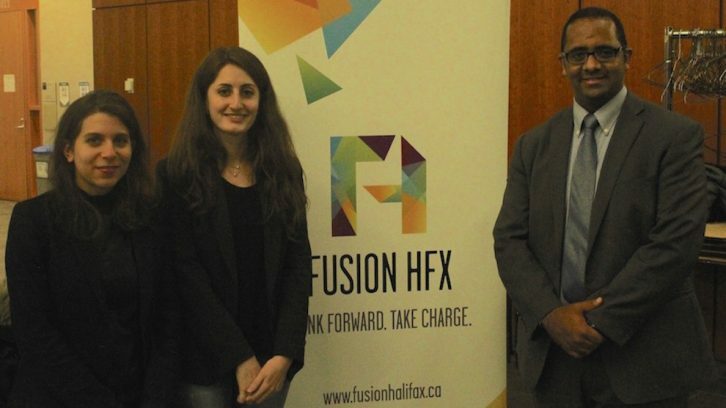 Members of Fusion Halifax, who partnered with Enactus Dalhousie to host the event. 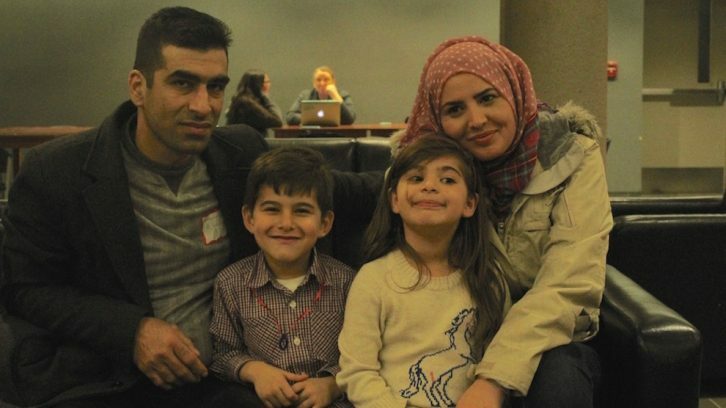 Mohammed Alhabash, his wife Almasa Sulaiman and their children Nada, 7, and Taim, 6, were the first Syrian family to arrive in Nova Scotia last December. Sulaiman says the Hadhad family’s example shows that anyone can be successful. Both parents pitched their business ideas at the conference. Alhabash, who works in a pizza restaurant while also studying English at Saint Mary’s University, wants to create better quality, locally made pizza boxes, so Canadian pizzerias can stop outsourcing from China. Sulaiman translates for her husband. Her English is better since she speaks with customers daily at the restaurant and the daycare where she works, but Alhabash mostly speaks Arabic at work. Sulaiman has ideas too. She wants to open her own full-service daycare, which will include a bus for children, staying open later hours and on weekends and offering specialized lessons, like piano or ballet. “Everybody has something; they just need somebody to support them,” she says, adding that since school is expensive here, she had to stop studying to be an engineer and Alhabash had to stop studying to be a lawyer. This is why they plan to open their businesses. “I meet people who already studied at university and finished their education but now they work in a taxi or wash dishes or clean a hotel,” she said. Al-Otumi hopes families like this one will be successful and create jobs for the Syrian community. “We’ll be linking them to mentors to help them throughout the phase of starting a business in Halifax,” he said. Dalrymple agrees that the Hadhads are a great example for Alhabash and Sulaiman. The most important part of the conference for Al-Otumi is how it has support from every sector. “That’s how we’re supposed to work to tackle our issues in the community – together,” he says.